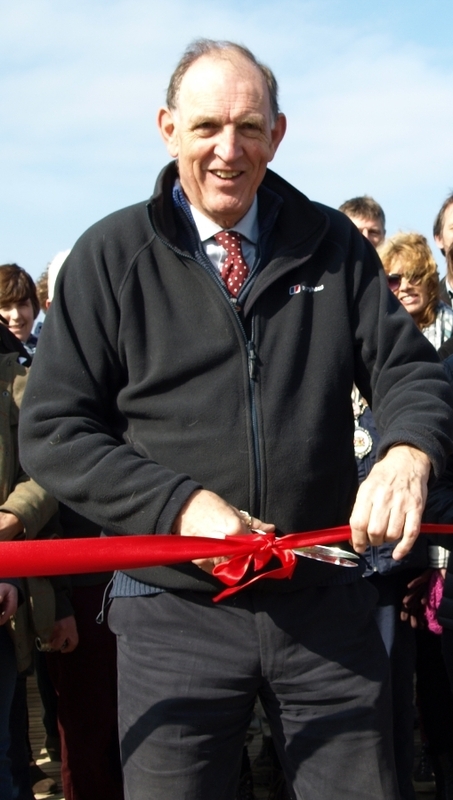 Natural England's Chairman, Andrew Sells, at the opening of the Somerset stretch of the England Coast Path. A warm welcome to Natural England’s new blog. This is a place where we’ll share updates on our work and stories from our staff. Natural England’s work is wonderfully diverse: from creating a continuous path around our coast and managing 140 National Nature Reserves, to conducting research on the recovery of the dormouse and monitoring populations of hen harriers, we cover every aspect of the natural world. I joined Natural England’s Board because I believe this work is hugely important. Our country’s environment and landscapes are a precious resource and a source of great pride to us all. Our environment is part of our culture, history and wellbeing, and we need to look after it carefully, both for present and future generations. I have been fortunate to be involved in a number of exciting milestones for Natural England. We’re now well on our way to creating the England Coast Path, a 2,700-mile trail which will be the world’s longest continuous coastal footpath. I was in Somerset in March for the opening of the Brean Down to Minehead stretch, and it was great to see the progress being made. And beyond the coast path we are in the process of helping the Government to designate the third tranche of Marine Conservation Zones. England has also stunning landscapes inland. Last year the Secretary of State made the decision – based on our recommendation – to extend the Yorkshire Dales and Lake District National Parks. Virtually joining these two National Parks confirms their importance and recognises they are iconic British landscapes. My wife and I recently spent four days walking in the Dales (and very wet and cold they were!). Whether it’s visiting a stretch of coast or a National Park, in the last two years it’s become clear to me that we’re an organisation full of passionate people with interesting stories to tell. That’s why we’ve set up this blog – it’s a place where you’ll be able to hear about the latest research we’re conducting and reports we’re releasing, insight from our staff and network of volunteers working on our nature reserves or protected sites, and updates on species we’re helping to protect. At the heart of our work is a focus on what we want to achieve in the real world rather than on rules and processes. While we will always base our advice on evidence, the law and government policy, we strive to work with the grain where possible, rather than against it. We’re currently in the early stages of developing our Conservation Strategy, which will support Defra’s 25-year Environment Plan. The Conservation Strategy will set out how we can achieve a healthy natural environment through a more modern approach – working more closely with others to help them achieve their goals while also helping the environment. We’re already seeing a flavour of this approach in our changes to licensing for European Protected Species such as the great crested newt, which involves simplifying the licensing process to reduce burdens on developers and enhance populations of newts at a larger scale. Woking in Surrey is the test-bed for this approach which we hope to expand soon. Alan Law, our Chief Officer of Strategy and Reform, will be writing more about this in a forthcoming blog post. HS2 is a great example of our practical advice making a difference to the real world. Our detailed work with this huge project over a number of years is helping to inform decisions about the route and ensure that impacts on the environment are avoided, minimised or compensated for. This work is invaluable as HS2 strives to be the first major infrastructure project in this country to achieve no net loss of biodiversity. We’re also looking at how we can be more flexible to solve the problem of bats in a number of our most cherished churches. In partnership with the Church of England, the Bat Conservation Trust and Historic England, it is a conflict I am serious about resolving. By working with a range of organisations we’re starting to achieve some success, employing research and new technology to understand how bats use churches so that they can be harmlessly kept away from sensitive areas. Those are just a few examples of how we are agreeing common and shared objectives and being flexible in our ways of working to help secure a healthy environment, economy and society. Our vast tracts of open countryside and the species they support, our stunning marine life and awe-inspiring mountains, moors and dales are worth protecting and I’m proud of the role we have to play in this. Please stay in touch with us right here for all the latest news. I am interested to your thoughts as Chairman, on the removal of schedule 1 licenses in the Forrest of Bowland in 2010, of the North West Raptor Group. This spectacular own goal has allowed persecution, to achieve the level of total removal of breeding Peregrines and Hen Harriers in this area in 2016. Yes you have licensed RSPB officers there, but what was the harm in having over 40 years of experienced raptor personnel patrolling the territory.This left few people to watch over the sights, resulting in this years disgraceful outcome. Would it not be prudent to reinstate these licenses and help protect any raptors that may want to come back in future years.